Migrated from GE's flagship system, the LOGIQTM S8 XDclearTM 2.0 system enables superb imaging across a wide range of clinical applications in a highly portable unit. Greater portability with a smaller footprint and the option to scan via battery alone for up to one hour. Productivity enhancers - such as large touchscreen and intuitive keyboard - help speed workflow. The LOGIQ S8 XDclear 2.0 system delivers superb images, from routine cases to the technically challenging. It is designed for a wide range of applications including abdominal, small parts, breast, vascular, OB/GYN, cardiology, pediatrics, musculoskeletal, urology and more. It balances performance with portability. 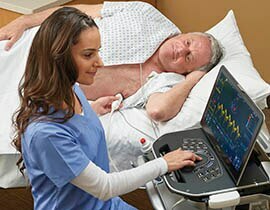 FibroScan technology has been developed by Echosens. FibroScan, VCTE and CAP are trademarks of Echosens. 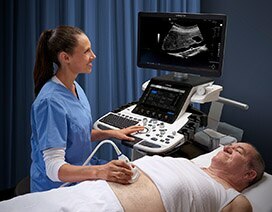 The Liver Package for the LOGIQ S8 XDclear 2.0 ultrasound system gives clinicians access to a comprehensive set of imaging and quantification capabilities that enable patients with liver disease to be managed in a reproducible way across the continuum of care. FibroScan with VCTE and CAP - Provides quantitative, reproducible information on liver tissue stiffness to assess disease regression/progression. The portable LOGIQ S8 XDclear 2.0 system provides superb, high resolution images of soft tissue organs, along with innovative navigation and workflow tools to help guide needles. The LOGIQ S8 XDclear 2.0 system provides superb, high-resolution images - from deep penetration in larger structures like hips and shoulders to finely-detailed visualization in smaller parts, like fingers and wrists. The portable LOGIQ S8 XDclear 2.0 system delivers simply amazing images, from neonates to teenagers. 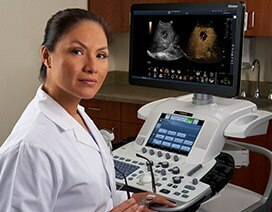 The LOGIQ S8 XDclear 2.0 system provides superb, consistent imaging across a wide range of applications, including cardiac, vascular, and OB/GYN. Plus, its portability and extended battery life make it easy to move from location to location to image patients. High efficiency ultrasound. LOGIQ E9 XDclear 2.0 and LOGIQ S8 with XDclear are among the most energy efficient in the industry. That means with every image you'll be using less energy, saving money, and contributing to a better environment. It's part of the GE commitment to invest in innovative solutions to environmental challenges, while empowering you with advanced tools for healthcare delivery.